I just wanted to say thank you to everyone who has shared their holiday traditions on our last post! I've decided not to close the thread like I originally planned - please keep contributing your traditions, (blog address optional) and commenters, please keep visiting bloggers who have already commented. 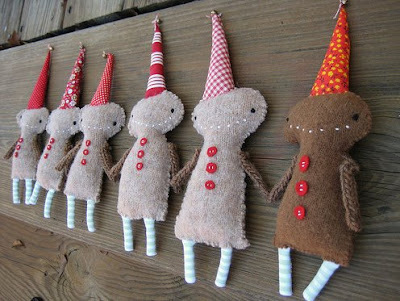 If you're curious, my holiday traditions can be found on my blog. I'm so thankful for all of you - believe me when I say that your creativity continually inspires me and your generosity blows me away. I wish you all the best this season! FYI: Comment Spam Alert: I'm assuming these comment spammers are human because they enter in the "captcha" phrase and have Google/blogger accounts and "blogs." One "blog" is just a collection of links that hawk car insurance - (Susan). Sometimes they go out of their way to say something that seems related to your post, then throw in an unrelated link to a site. They get what they want when you click the link: every click increases their search engine ranking. So FYI, if you see any odd or spammy comments that include a link, don't click on them! Or, as they say in the genius commercial I adore: Happy Chrismahanukkahkwanzaa! Our group has grown so much over the past couple of years, and I'd love for us all to get to know each other better, so I devised a new holiday edition of our (highly successful) blog expedition! 1. Please leave a comment telling us about your holiday traditions: it can be silly, funny, weird, or serious: however you choose to celebrate the holidays. 2. At the bottom of your comment, include your blog address, (important!) or if you don't have a blog, a link to your Flickr photo stream. 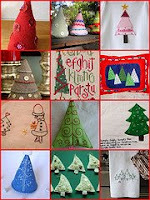 I will leave a comment on the blog of everyone who comments on this post (preferably a crafty blog). So every person who leaves a comment here will get 3 new comments on their blog (I'll leave extra comments on commenters #1 and #2)! You're more than welcome to comment on more than 2 peeps - I'm sure everyone appreciates visitors! Special note to spammers: Don't even think about it. Especially if you're a spammer named Susan and you hawk car insurance. Have a heart, spamming peeps! If not, thimble guy will talk to Santa and you'll have a big ol' lump of spam coal in your stocking. Does this sound good? Yeah? Then bring on the holiday traditions, people, and let the Holiday Comment Expedition begin!!!! 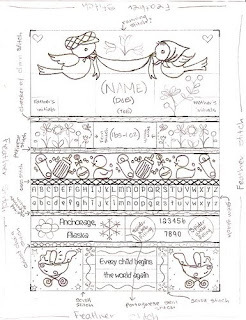 There are 2 free embroidery patterns and a stocking pattern, and Pip walks you through everything you need to know to make your stocking. 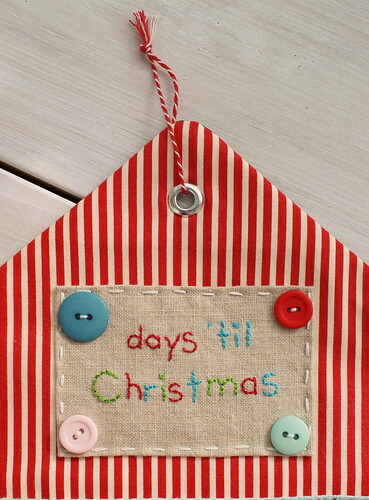 So even if it's not cold outside, curl up with a little stitching this holiday! 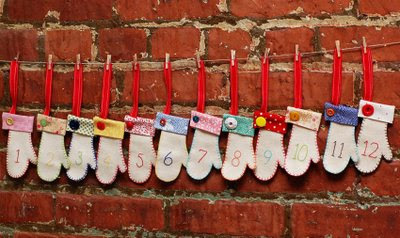 Check out this free mitten pattern from oliver + s... 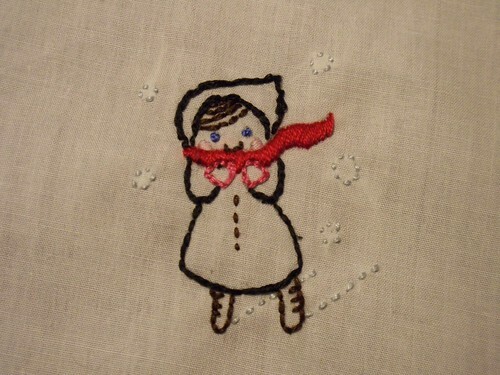 I think it's a great idea to craft a mitten a day, and have a little one pick out the fabrics and buttons with you. 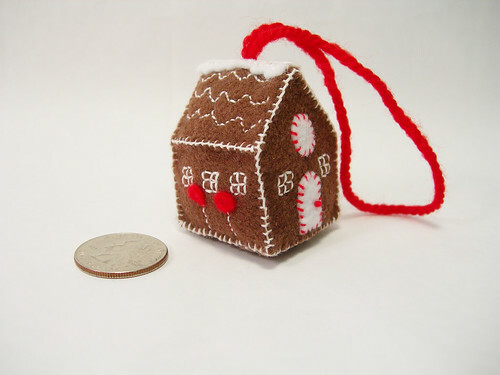 Very quick and cute, and much less time-intensive than crafting all the mittens at once! Get the pattern. 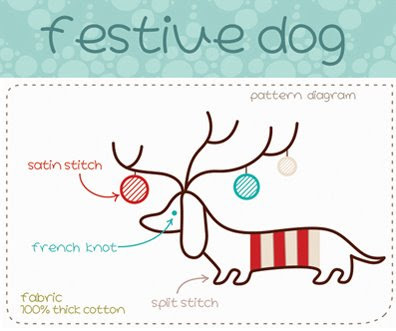 Ok, I may very well be the last person who has discovered this festive dog pattern from Helen Dardik, but please, people, how cute is this?!! There are full instructions to complete your doggie on Helen's blog. 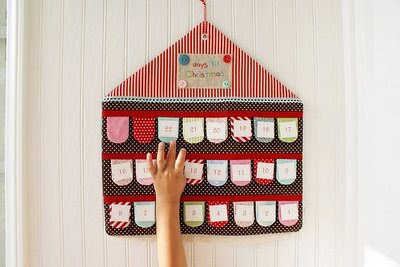 My favorite part about this project is it is simple and quick (perfect for last-minute crafting) and even a beginner can make something drop-dead adorable. Just for the record people... this is a dachsund... with reindeer antlers... and ornaments hanging from his festive little head... I'm sorry, I just died from the cuteness. It's been a long time since I've done my Tuesday mosaics, so here is one in the Holiday Spirit -- here are some lovely trees people have embroidered. Some are traditionals, others are softies. 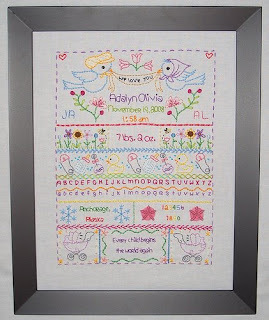 They are largely from the Flickr Embroidery Pool and the Soft Trees Group on flickr. Enjoy! 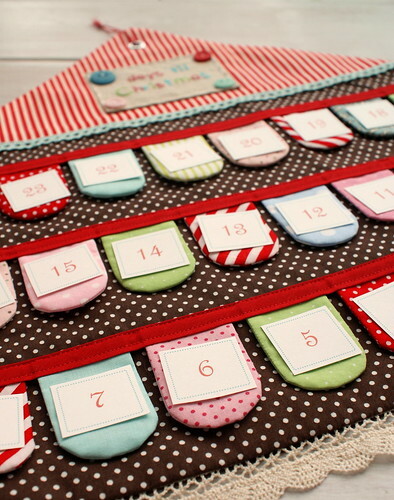 I just had to show you this advent calendar by nanacompany. I wanted to tell you all about something very special going on right now, a wonderful person you may know, Linda Permann, started an Etsy store to raise money for her brother-in-law who is fighting stage IV kidney cancer. I'm not the only who knows how hard it is to make ends meet during the holiday season - and maybe you know firsthand how scary it is to deal with a sick family member and huge, scary hospital bills. 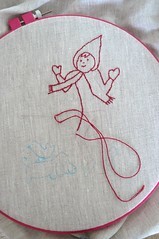 That's why I think what she is doing is so lovely - with the help of crafters (and her own crafts) she's donating 100% of the proceeds from her store to Jasenn and his family. So often we want to do a little something for someone else during the holiday season, but feel weird about giving to strangers or don't know where to start... this is a perfect way to give to a wonderful person and get something in return! 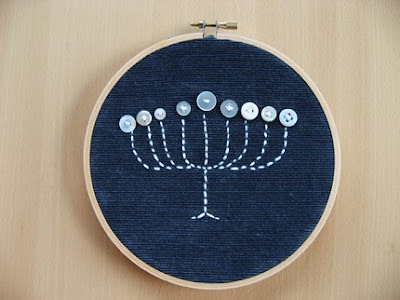 I donated my embroidered menorah to the store, and I would be honored if any of you purchase that or anything else from Linda's store. 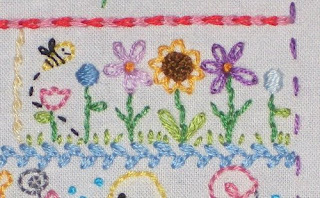 I would ship my embroidered piece to you, along with a few little goodies from my stash and my sincerest thanks for helping a young family this holiday! There are tons of great things in her shop, be sure to check it out! Update: You guys are amazing! One day after this post, my menorah was purchased by Alli - thank you! There are still so many great things in the store - please visit! I loved following the development of such a lovely piece. 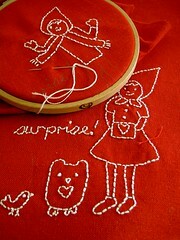 If you follow the development of Lilyvanilli72's embroidery, you will enjoy the experience. This was a very ambitious project and she really impressed me with it, so I wanted to share it. I love the colors, so much like good sherbet! Delicious! Lilyvanilli72 has been highlighted before on the blog, but she just continues to show such wonderful things! Be sure to visit Lily's Blog, too. I read that Lily entered this into a contest that we can vote for her. Be sure to go to her blog to get the link to vote!